How to optimise cement dispatch on a limited plot of land? That is the difficult question PT Holcim Indonesia Tbk. had to answer when designing its Lampung terminal. The main issue was that the available area was limited, so there would be only a few parking slots for trucks waiting to be loaded with bulk or bagged cement. That meant an efficient solution had to be found to maximise the output of the plant, in terms of dispatching capacity. Moreover, a wide range of trucks had to be accommodated; flexibility was therefore not an option. To solve these problems, PT Holcim Indonesia Tbk. decided to team up with FLSmidth Ventomatic® as the EP supplier of the Lampung terminal. 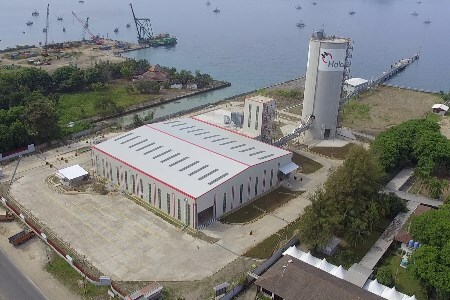 "Loading in Lampung: Part 1"
The first task was to efficiently supply cement to the plant and store it: a pneumatic transport system fills a 10 000 t Ventomatic® inverted cone silo from self-unloading vessels. The solution was designed so that the compressors on the ship can unload the material without external help at high capacities of up to 250 tph. As power limitations are enforced in the Lampung area, the plant needed to be able to run with minimum power consumption. Potentially, such systems can be very energy intensive, so it was indispensable to supply a solution that would minimise power requirements. The second issue was to optimise cement dispatch. The Ventomatic® logistics system ensures a seamless distribution, by tracking trucks through a system of badge reading from plant entrance to exit. Drivers are equipped with RFID badges, on which the type of cement, quantity, and form are stored, based on the orders. From the terminal’s entrance gate, trucks are guided to the inlet weighbridge, then to either the Ventomatic® inverted cone silo for bulk cement, or to the warehouse for bagged cement. Once loaded, trucks proceed to the outlet weighbridge for final verification and check-out. All operations are recorded and made available for control and invoicing. A Ventomatic® bulk loader precisely fills bulk trucks. It is integrated into the silo to limit both equipment installed, and footprint. The interlock with the weighbridge underneath guarantees a high weight accuracy even at a capacity of 300 tph. In the packing plant, an automatic high-capacity line is installed: a GIROMAT® EVO V12 twelve-spout rotary packer with vertical axis impeller – with an INFILROT® Z 40 shooting bag applicator – for a capacity of 3600 bags/hr of 50 kg each. These are dispatched to a POLIMAT® palletiser, fitted with a Ventomatic® Flying Fork-Lift FFL (Figure 3) automatic truck loader for stacks of bags, or to a manual truck loader for smaller vehicles. This article first appeared in Cement Plants of the Future.